A proposed one to two story office development was underlain by approximately 10 feet of old, uncompacted fill. The site was immediately adjacent to a small bank and within 150 feet of an office building. Dynamic compaction was selected by the engineer to compact the existing fill to allow shallow foundation support. Compaction was performed with a six ton weight dropped from a height of about 40 feet. A total of three passes were made over the site, resulting in an enforced subsidence of approximately one foot. 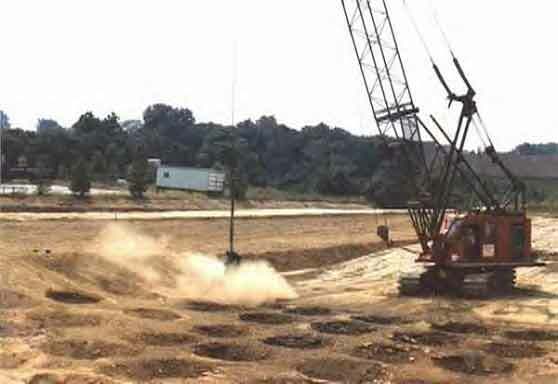 No vibration-related damage was caused by the compaction operations. Following dynamic compaction, the building pad had an allowable bearing capacity of 2 ksf.